Kidney transplant sailor raring to go for coming season. Thirty four year old racing dinghy sailor Stu Budden is now back at the helm for the coming season thanks to a successful kidney transplant. 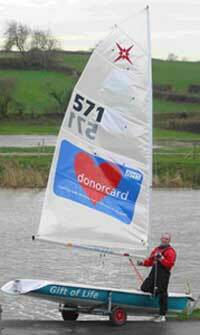 Sponsored by NHS UK, Stu will be sailing with a giant organ donor card graphic emblazoned on the mainsail of his new Supernova. Naming his new craft Gift of Life his aim is to emphasise the importance of organ donation. Stu was diagnosed as suffering from end-stage renal failure in May 2002. Although he tried carry on sailing but was shorebound for many races. He bought a camper van in order to transport his vital, blood-cleansing dialysis equipment to distant events until finally undergoing a successful transplant in September last year. The Supernova is a new but rapidly growing single-handed racing class and 17 events dedicated to the boat are held each year. Stu will also be taking the Gift of Life to many other events this season to race against different classes of dinghy.